Some people seem to be happy no matter what happens in their lives. Some people are sad and depressed, no matter how well off they are financially. Some people feel secure and peaceful, even though they may have none of the stuff other people have. What's going on here? What's the secret? It may be hard to believe, but happiness is only a thought away. It's really true. What happens within determines what happens without. 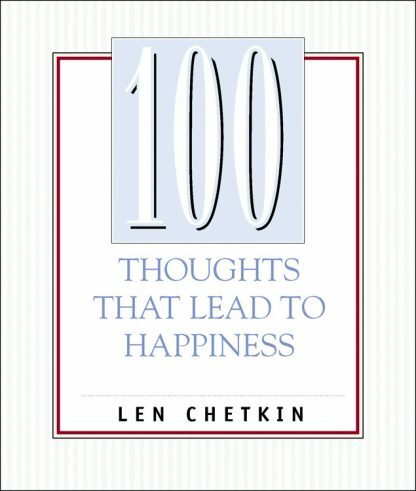 To demonstrate how and why this is true, Len Chetkin gives us 100 thoughts, and accompanies them with 100 examples from his own life. These hundred thoughts can change the way you look at the world, which leads directly to happiness, because your own thoughts are the one thing in your life you can control. You can't control other people, or what they do. But you can control the way you think about it. In every way possible, who we are is the result of what we think. Here's how to understand how that really works. What Len Chetkin learned the hard way, you can learn the easy way, in this simple yet profound little book.